Editor’s note: This post is the fourth in the NextBillion series Going Off Grid. To read other contributions in the series, click here. If we want to bring energy access to the 1 billion-plus people living without it today we know where the focus needs to be: off the grid. In fact, according to the World Energy Outlook, 60 percent of new investment in rural electricity generation will need to be focused on mini-grid or stand-alone decentralized options to meet demand. Grid-based extensions are cost prohibitive in many cases, yet low population density and limited returns reduce the incentives for private sector, donor and government actors to engage in decentralized energy options. “Fewer than 13 percent of rural Malawians have access to grid electricity. The Mulanje Electricity Generation Authority (MEGA) aims to change that and to create a far more cost effective solution than expanding the grid. MEGA is Malawi’s first independent power producing company, a mini-grid system that uses hydropower to bring power to remote areas where a grid is unlikely to arrive. MEGA is a multi-site social energy business in southern Africa, based on 10 planned micro-hydro schemes on the fast-moving rivers of Mount Mulanje, Malawi. But the main thing that sets MEGA apart is our enterprise model. Where many approaches use public or community ownership, MEGA is run as an enterprise that employs a clustered approach to mini-grid management. And the way we use our pre-paid system allows for different levels of consumption. Clustering several schemes under a single enterprise drives down organizational, managerial and operational costs. MEGA will build and retain capacity through meaningful employment and long-term financial viability ensures the systems are maintained (and expanded) sustainably. Prepayment metering ensures poor families can connect and pay for electricity on a sustainable basis (experience shows that post-payment leads to unpayable debt) and helps ensure the financials of the systems. This approach allows people from different income levels to access the energy the system provides. (More on this below.) Analysis of current and forecast household energy expenditures in the region shows that, on average, 15 percent of rural household income will be saved by those accessing MEGA electricity for lighting and other household uses. MEGA grew out of a Practical Action-implemented project. Our work takes a total energy access approach to policy and practice, recognizing the full range of energy services which people need, want and have a right to. It also promotes the concept of technology justice, ensuring equitable access to energy services for the poorest and marginalised. Since 2010, Practical Action has developed reports on Poor People’s Energy Outlook. 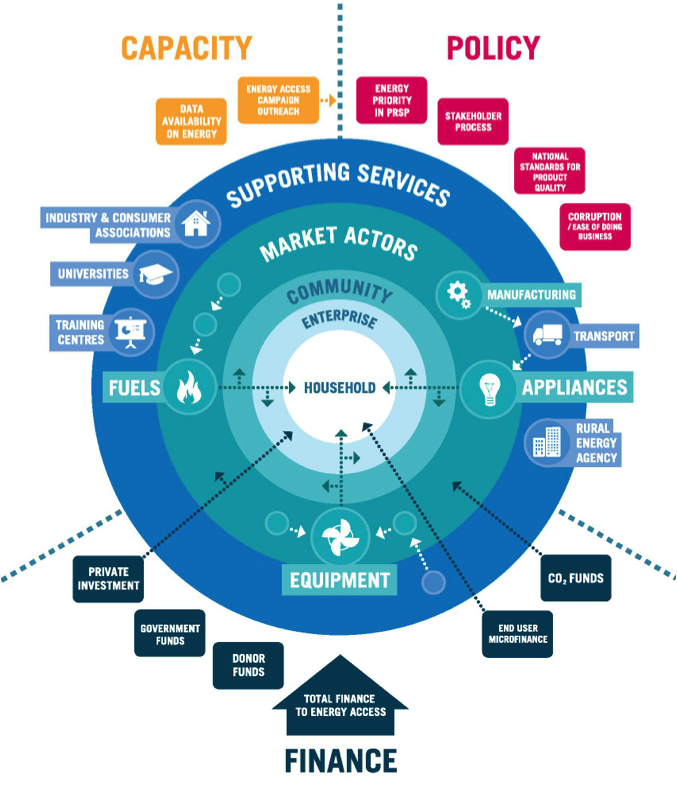 Making energy work for the poor requires an ecosystem dependent on more than just the market actors themselves (details of that ecosystem are illustrated in the graphic below). At Practical Action, we developed the “energy access ecosystems” framework into a useful tool to measure and understand the “health” of a specific country’s energy system. It can also be used to assess the potential for making rapid progress toward universal energy access. MEGA has been built around partnerships that include all three sectors in this framework: capacity, policy and finance. In addition to providing low-cost energy to populations that have traditionally depended on inferior fuel (such as charcoal), MEGA will also enhance upstream watershed catchment management and protect the fragile ecosystems at the base of the mountain. The total market size in the area is 520,000, of which we expect 9,600 people will be connected. We also expect MEGA to become a financially self-sustaining operation within six years, after our fifth generator comes online. At this point, our first generator is ready; we are just waiting for the Malawi Energy Regulatory Authority to supply us with our license to operate. MEGA operates as a not-for-profit social enterprise, with any profits returning to a community development activity. Our social mission has led it to follow a policy of price minimization instead of profit maximization, and as a result, we envision different customer types will pay different rates for energy. MEGA manages this on the household level through a prepaid PAYG metering system, with community vendors selling credits that households can use to buy energy services. This ensures that households can afford to purchase electricity in relation to their income, but also facilitates easy revenue collection by allowing customers to pay in advance. Businesses, business centers and social facilities (such as schools and clinics) have a separate payment arrangement to allow enhanced access to health services and education to the wider community. Technical stats: Generates electricity from a 40-100 kilowatt micro-hydro turbine and distributing to customers via mini-grids, with aims to develop 10 sites by 2023. Inclusive throughout its value chain: Communities participate in the ownership and governance structures of the organization; in-site construction, operation and retail; and form the key target customer group. Private approach to community-based energy generation: Instead of site development followed by “handover” to communities, MEGA runs all sites to achieve economies of scale but engages closely with communities throughout. At this point, MEGA is in its early stages. Part of what influences our speed of launch is connected to our desire to teach other actors how to replicate MEGA experiences in Malawi. We hope this model is useful for development actors that are not in the energy sector so they can start mainstreaming energy access in their programs. There are many areas where development activities would be improved with better access to energy, such as providing power for health centers, or connecting irrigation systems for agriculture activities (this sometimes is referred to as productive use). Related: For more, check out this 2013 case study from the Business Innovation Center. MEGA’s initial activities have been promising but are not without their own challenges. Capacity development and retention issues – Technical skills needed by minigrid operators are scarce outside cities. Universities and colleges are adapting and adopting courses for renewable energies, but the pace needs to be accelerated. Government awareness and regulation – National grid expansion is often subsidized and risk is underwritten by governments. Bureaucratic delays (such as obtaining licenses) undermine the return on investments. Even if tariffs are not set by regulators, low national grid tariffs set up unrealistic expectations for off-grid tariffs. The import/local production dilemma – Importing is expensive, undermines the development of local industry and doesn’t allow for the development of skills necessary for the maintenance, diagnosis and repair of systems. On the other hand, current imports are higher quality and usually highly efficient. For example, with micro-hydro, the primary energy resource is limited by the nature of the river, so any inefficiency will reduce the possible total power output. With solar, that is different, because another photovoltaic panel could always be added. Locally manufactured components tend to be lower quality with lower efficiency, but deliver on the softer issues that importation doesn’t (repairability, local control, etc.). Community ownership – In some places, we’ve used a share-based approach where individual community members have been allocated “shares” depending on their level of unpaid input during construction. In other places we have established community trusts to own and operate. We have seen that community engagement is absolutely critical for the success of a scheme. One of the questions we grapple with now is how to blend part community ownership with part social enterprise, spread over various endeavors. We are exploring options for ownership that could mix private or social enterprise ownership with community ownership. Making this decision on final ownership is a current focus of the MEGA board. Long-term funding and financing – Although donor funds (European Commission, Practical Action and the OPEC Fund for International Development) have supported initial scale-up, MEGA runs as a social enterprise. The challenges currently faced by MEGA continue to be start-up funding challenges, including funding for initial capital and technical challenges related to micro-hydro installations and maintenance that has affected revenue collection. Although we have shown models indicating we will break even six years after launch, finding investors can be a challenge while adhering to our social mission. This also comes back to the question of local engagement and how grant funding, loans and equity are accounted for in a mix that includes community investment. We have depended more on donors who can supply start-up capital in the form of grants, and grants are a good thing. In fact, the difference between a government subsidy and a grant is often not that great, and government subsidies have been integral to the development of energy systems around the world. But as we grow, we also need to shift to identify more private sector funding. The value proposition for the private sector and a donor, though present in both cases, is often different, and we have to consider that when looking for growth capital. The MEGA project is both an experiment in terms of a new type of energy generation, coupled with nontraditional forms of customer delivery/payment and new ways of sourcing capital. But if we will make good on our promise on bringing new off-grid sources to market for rural, low-income consumers, new ways of thinking will be necessary. We think we are up to this task. Glen Burnett is director of U.S. Operations for Practical Action.